Casa Vasuda is a private villa situated in the popular area of La Capellania,(Tamaragua). Situated just 3km from the main resort of Corralejo, this spacious, 3 bedroom, 2 bathroom, detached villa is fully equipped with everything to make your time unforgettable. 32" LCD TV, European and British TV system (including BBC1, ITV, C4, Five), Fibre optic internet/WiFi access is free. The villa has a large sun terrace/patio area complete with your own private pool. Sue and I moved out to Fuerteventura in 2007 and purchased our own house on La Capellania. Sue works as a self employed property manager. Casa Vasuda, which we purchased in 2011 is actually located just 3 mins walk from our own home. En-suite bathroom has wc, sink, bidet and shower. Bathroom 2 has wc, sink, bidet and full size bath with overhead shower. The large, airy lounge has ample seating on the 3+2 leather sofas. 6 seater dining table. TV, satellite, DVD, Stereo system. Hob, oven, fridge/freezer, microwave, washing machine, plenty of work surface and all utensils. 9 hole course available just 10 mins drive or 40 min drive takes you to 2 championship courses. Outside: The garden/terrace has ample space for lounging around the pool. The garden has been designed to provide a comfortable, safe area and to blend in with the local landscape. Cleaning / Towels / Linen / Maid service: Towels and linen included (beach towels also provided) We have installed a water filter so there is no need now for bottled water. Villa was clean and tidy. Kitchen was well stocked with utensils and equipment. Tv entertainment/DVD/games/WiFi etc were well catered for. Outside pool area was sunny all day. Great position super market close by. Owner was there in five minutes of our arrival to welcome us. Would definitely stay again. We had a great family holiday at Dave and Susan’s villa. A very clean and well equipped villa, it was like home from home. A lovely quiet location, with a good bus service to the surrounding area, so no need for a car should you not wish to hire one. Dave and Susan were very informative and helpful when we met them at the beginning of our stay. The villa has a lovely pool, we will definitely return in the future. A clean well presented villa with everything you need and more. Great location for peace and quiet and no more than 5mins drive into corralejo. The pictures do not do this place justice! Glad you enjoyed it. See you soon !! Thank you for respecting the property. We have just had a fantastic week in Sept 2018 at Dave and Sues place. It’s really is home from home, with great Wi-fi, UKTV, lovely private garden and pool, loads of space and spotlessly clean. Would highly recommend, Dave and Sue live round the corner and go the extra mile to make sure you have a great time, thanks again for a lovely holiday, Jones family. Thank you for the kind comments. We are glad you had a great holiday and look forward to seeing you again. Also thank you for leaving the house clean and tidy - it is much appreciated. My family and I had a fantastic week away in May, the house was spacious and well laid out. The kitchen had everything you would need and more. Utility room was a bonus. Beds were comfy. Rooms cool in evenings which was a blessing. The pool was a fantastic size for the kids and husband to play/swim in. Whole place was well maintained and clean. We will be booking again. We have regularly stayed here and the owners are very helpful and considerate to holiday needs. The property is always very clean and tidy and often has been redecorated so never looks tired. There is plenty of room and comes with a dishwasher and washing machine - very useful. The garden is a real suntrap and the location is perfect with off-street parking. Great accommodation and we will definitely be booking again. 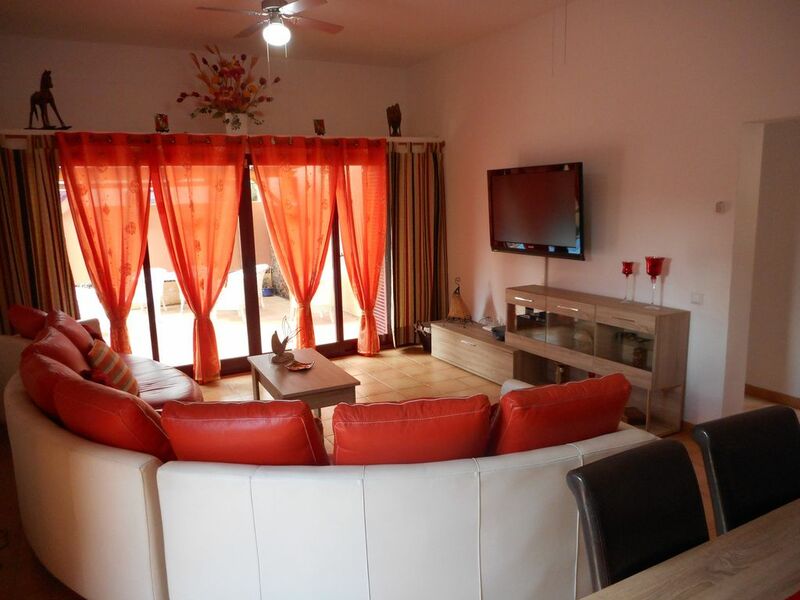 Casa Vasuda is a short 5-10 minute drive from the famous sand dunes and natural park. Flag Beach is found in this vicinity and is very popular with water sport enthusiasts and sunbathers alike. A 10-15 minute drive in the other direction takes you to the fabulous beaches and lagoons of El Cotillo. Corralejo's own town beaches are just a 5 minute drive away. Taxis are readily available and public transport is both reliable and inexpensive. Corralejo resort centre 5km. Baku water park 3km. 5 minute walk to a full size supermarket, Spanish cafe/bar, Spanish bar, British sports bar and internet cafe. Booking Notes: Please contact owner Changeover Day: Please enquire.